An often overlooked part of any home's heating and cooling system is the duct work. Duct work needs to be properly designed to efficiently move air throughout the house. Some older homes have duct work that is poorly assembled leading to bad air circulation. Arctic Fox Air Conditioning and Heating specializes in the installation and repair of your home's duct work. Many of the problems with older duct work is that it has developed leaks. Over time, duct work connections can come loose or can be damaged. The duct work specialists at Arctic Fox Air Conditioning and Heating will come to your home and thoroughly inspect your entire duct work system with an emphasis on leaks. Leaks will greatly reduce the effectiveness of your air conditioning system. We will locate any leaks and completely reseal them using with sealants like Glen Cote or Mastic Duct Sealant. Modifications to a duct work system are commonly needed. Cool air being generated by your home's air conditioner prefers to travel in the straightest path possible. Duct work systems that have many twists and turns greatly reduce airflow. This can make certain rooms in your home receive less air than other rooms. This is known as a duct work system that is out of balance. To solve this, a Duct Work technician from Arctic Fox Air Conditioning and Heating can install a device called a scoop which forces air into the room keeping it as cool as the other rooms in the house. Arctic Fox Air Conditioning and Heating can professionally install new duct work in your home. No matter if it is new construction or you needed to have your current duct work replaced, our technicians can design and install a duct work system that will efficiently move air throughout your home. We will analyze the needs of your air conditioning system to ensure that you receive the proper size of duct work that will help optimize the efficiency of the complete system. Our technicians are able to work with flex duct work that is common in new homes. The installation of new flex duct work with better insulation properties will help to reduce energy costs and increase the efficiency of your air conditioning system. We also can install spiral or galvanized duct work. 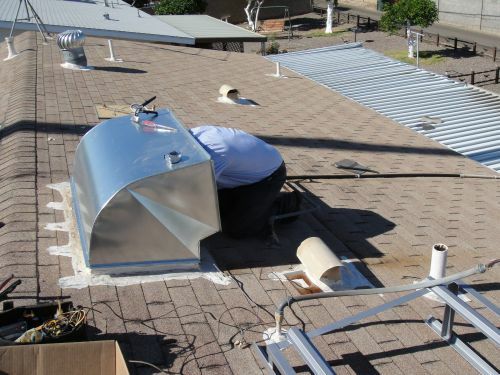 Arctic Fox Air Conditioning and Heating provides duct work repair and installation for homes in Phoenix and throughout the communities of the West Valley like Sun City, Glendale, Avondale, Surprise, and Peoria. To schedule duct work repair or installation for your home, call Arctic Fox Air Conditioning and Heating at 623-533-5718 today. You can also reach use with any questions that you may have about duct work repair and installation through our Contact Us page.